Gunung Mulu National Park near Miri, Sarawak, Malaysian Borneo, encompasses remarkable caves and karst formations in a mountainous equatorial rainforest setting. The Sarawak chamber, in Gua Nasib Bagus, has been identified as the largest underground chamber in the world, three times larger the Big Room in Carlsbad Caverns National Park, New Mexico, previously the largest. The national park presents a challenge to explorers who choose to travel by land as the location is located in a remote jungle setting. The park, famous for its caves, has been renown for the expeditions conducted to explore them and their surrounding rain forest, most notably Benarat 2005 Expedition and the Royal Geographic Expedition of 1977-1978, with more than 100 scientists in the field for fifteen months. They explored Gunung Benarat, discovering the extensions in the Benarat Caves as well as newly discovering Whiterock cave (Gua Batu Putih). UNESCO designated the Gunung Mulu National Park a World Heritage Site in 2000. The Sarawak chamber, found in Gua Nasib Bagus, lay within Gunung Mulu National Park, the world's biggest natural enclosed space. The cave measures 2,300 feet (700 meters) long, 1,300 feet (396 meters) wide and 230 feet (70 meters) high. Other notable caves include Benarat Cavern, Deer Cave, Wind Cave, and Clearwater Cave. Spelunkers continue to explore Gunung Mulu for adventure, the same thrill that attracted the first explorers. The primary focus has shifted to the promotion of an awareness of the significance of the park and its environment through ecotourism. Ecotourism fosters understanding and appreciation of the park's value for its natural beauty. Gunung Mulu, a remote and inaccessible area, proves a challenge to get to reach by land. Most researchers and explorers travel by air from Miri airport, although riverboats offer another way to travel most the distance to the national park. Riverboat travelers finish the last part of the trip by long boat. 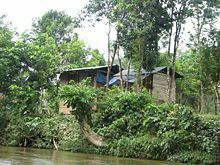 The river route requires twelve hours from Miri to Gunung Muly, while an air flight takes only thirty minutes. The national park takes its name from Mount Mulu (Malay: Gunung Mulu) (elevation 7, 795 feet). A sandstone and shale mountain, only Mount Murud has a higher elevation in Sarawak. Gua Nasib Bagus (Good Luck Cave) or Lubang Nasib Bagus is the outstanding cave found within Gunung Mulu National Park, housing Sarawak Chamber, the largest known underground chamber in the world. Three English explorers discovered Sarawak Chamber in January 1981. Andy Eavis, Dave Checkley, and Tony White (all experienced cave explorers) had been exploring the dense, unpopulated area of the Gunung Mulu National Park jungle in an expedition led by fellow Englishman Ben Lyon. While surveying some of the newly found caves in the region, they stumbled into a huge cavern. Even with their powerful lamps, they could not see the other end of the chamber through the darkness. The three explorers had walked into the largest known enclosed space in the world, which they later named the Sarawak Chamber. Three times the size of the Big Room in Carlsbad Caverns National Park, New Mexico, previously thought to be the largest underground chamber, the chamber measures 700 meters (2,300 feet) long, 400 meters (1,300 feet) wide and at least 70 meters (230 feet) high. The chamber could hold ten jumbo jets nose-to-tail. To reach the Sarawak Chamber requires following the river upstream from the cave entrance. That long passage has a roof of at least 230 meters high, requiring swimming and a traverse along a ledge. The story of how it was discovered has been recorded "Underground Worlds" by Donald Jackson and also in "Giant Caves of Borneo" by Meredith, Wooldridge and Lyon. The Benarat 2005 Expedition to Gunung Mulu National Park, took place between September 8 and October 7, 2005. The expedition was the latest in a series of Anglo-Sarawak cooperative activities which commenced in 1977. 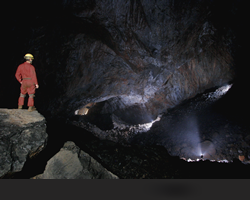 Sixteen United Kingdom based spelunkers worked the exploration for varying periods of time, together with a number of officers from the Gunung Mulu National Park. The expedition was one of a series of explorations in Gunung Benarat and the northern end of Gunung Api. At the end of the 2003 expedition, a number of excellent underground leads had been discovered in the Benarat Caves and the discovery of Whiterock Cave (Gua Batu Putih), close to Blackrock Cave, offered new hopes of major extensions in Gunung Api. Prove the connection of the Blue Moonlight Bay Cave and the Terikan Cave systems. Find the connection from Cobweb Cave to neighboring systems. Access the remaining high level entrance to the east of Tiger Cave by climbing the Benarat Cliffs. Carry out further exploration of Sakai's Cave (last explored in 1984). Locate and explore Canopy Cave. Locate new entrances in the northern slopes of Gunung Api. Blue Moonlight Bay and Terikan Connections. Explorers successfully dived the sumps separating Terikan East/Terikan West and Terikan East/Terikan Rising, discovering a single system 32.573 kilometers in length. Divers successfully navigated the upstream sump in Blue Moonlight Bay to a depth of fifty three meters. They circled the sump, a vertical shaft, at depths of six meters and twenty meters without finding branches leading into other systems. The sump continues vertically downward, offering opportunities for further exploration. High level entrance. Climbers abandoned the attempt to find the high level entrance at approximately eighty meters. At sixty meters, the climbers discovered a new cave entrance, that becoming the focus of efforts. Named Moon Cave or Gua Bulan in Malay, the system consists of a main passage heading straight along the strike. Spelunkers explored the cave repeatedly, discovering a total length of 6.635 kilometers to a concluding boulder ramp with no draft found. All exploration was carried out on the single level and a number of outstanding leads remain in the form of upward and downward trending ramps. Exploration of Whiterock Cave. Substantial extensions were made to Whiterock Cave. A further 17.261 kilometers of passage was explored, bringing the total to 20.968 kilometers. Whiterock constitutes a multi-level system, providing a key to the cave formation at the northern end of Gunung Api. Its upper levels consist of large passages, partially blocked with sediment, including extensive deposits of rotted cobbles reminiscent of similar deposits in Clearwater Cave and indicative of great age. The cave includes the Api Chamber, approximately 300 x 200 meters in dimension with a surveyed circumference of 900 meters. Two connections were established to Blackrock Cave via the Eagle Ramp and Firecracker. The inclusion of Whiterock brings the total length of the Clearwater System to over 130 kilometers. The Racer Entrance to Blackrock was relocated and a GPS position was fixed. Much of Whiterock remains for future exploration, a number of leads remained outstanding. The location of Canopy Cave had been recalculated, and no open passage way exists. A number of small entrances were located, none of them considered promising. GPS coordinates were fixed for future reference. All explored passage was surveyed to the acceptable standards. Data was entered into the Survex program, creating field surveys. ↑ S. L. Wong, Exciting Malaysia: A Visual Journey (Hong Kong: Periplus, 1989), 43. ↑ K. S. Chon, Tourism in Southeast Asia: A New Direction (New York: Haworth Hospitality Press, 2000), 43. ↑ Avijit Gupta, The Physical Geography of Southeast Asia (Oxford: Oxford University Press, 2005), 175. ↑ Wild Asia, Eco Over Easy: A Guide to Malaysia's Eco Resorts. Retrieved November 24, 2008. ↑ Shaharin Yussof, The Natural and Other Histories of Batu Caves (Kuala Lumpur, Malaysia: Malaysian Nature Society, 1997), 12. ↑ Donald Dale Jackson, Underground worlds. Planet earth, 6 (Alexandria, Va: Time-Life Books, 1982). ↑ Mike Meredith, Jerry Wooldridge, and Ben Lyon, Giant Caves of Borneo (Kuala Lumpur, Malaysia: Tropical Press, 1992). Chon, K. S. 2000. Tourism in Southeast Asia: a new direction. New York: Haworth Hospitality Press. ISBN 9780789007322. Gupta, Avijit. 2005. The Physical Geography of Southeast Asia. Oxford regional environments. Oxford: Oxford University Press. ISBN 9780199248025. Jackson, Donald Dale. 1982. Underground worlds. Planet earth, 6. Alexandria, Va: Time-Life Books. ISBN 9780809443208. Meredith, Mike, Jerry Wooldridge, and Ben Lyon. 1992. Giant Caves of Borneo. Kuala Lumpur, Malaysia: Tropical Press. ISBN 9789677300705. Reader's Digest Ltd. 1989. "Facts and Fallacies: Stories of the Strange and Unusual." Reader's Digest Ltd. ISBN 0864380879. Wong., S. L. 1998. Exciting Malaysia: A Visual Journey. Hong Kong: Periplus. ISBN 9789625933283. Mulu National Park official website. 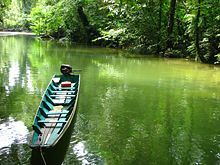 History of "Gunung Mulu National Park"
This page was last modified on 20 July 2017, at 00:12.